ENZOHAIR Holistic is for people who care about what they put in and on their bodies. Weâ€™re for people who care about and want to live in harmony with nature. 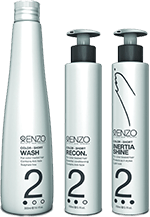 To ensure that all ENZOHAIR clients receive the most accurate hair health assessment for their own personal product prescription, ENZOHAIR has developed a series of proprietary techniques to measure and prescribe hair products and regimen individually tailored to each client. We analyze, diagnose and prescribe hair and scalp products suited to each client’s individual hair type and condition. We take into consideration additional factors such as individual living environments, lifestyle factors and unique personal hairstyles. Whether you live in the tropics or the Alps, close to the sear or in the desert, our ENZOHAIR hair and scalp health products are all varied to accommodate these differential factors. Use hair color? Use Mechanical Styling Tools? These factors and many more weigh in on your final hair health prescription. Once your hair product selection is prescribed, we ensure supervision of your individual hair solutions making adjustments along the way in order to maximize your short and long term ENZOHAIR results. As Hairdressers, trichologists and cosmetologists, we are devoted to producing the most advanced natural hair health product systems available today with specific hair analysis techniques developed and patented by ENZOHAIR. With the launch of our first Enzo Hair Health Spa and Clinic in San Francisco’s Marina District in 1994, our focus remains today to prescribe hair health products to our customers ensuring that all our prescribed products are tailored to each individual’s specific hair type and needs. Not all hair is the same! Hair condition differs based on length, texture, the environment, the overall health of the individual and how we style it with mechanical tools such as blow dryers, hot irons and tongs. All of these factors have a depleting effect on our hair’s protein base thereby causing dryness, porosity and simply put, Bad Hair Days!